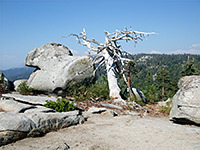 Although the full splendor of the granite landscapes of the Sierra Nevada is only apparent above the treeline, over 9,000 feet, there are many rocky outcrops at lower elevations, and the Generals Highway (CA 198) between Kings Canyon and Sequoia national parks passes close to several granite domes whose summits can be reached by maintained trails, namely Big Baldy, Little Baldy, Sunset Rock, Moro Rock and Buena Vista Peak. This latter has the easiest trail, just 0.8 miles up a gentle, partly wooded slope to the 7,605 foot peak, from where a sizeable area of mountains and canyons is in view, from the Central Valley in the west across to the Great Western Divide in the east. The trail begins at a small layby on the west side of the Generals Highway nearly opposite the larger parking area for Kings Canyon Overlook, and 4.7 miles from the 198/180 junction. 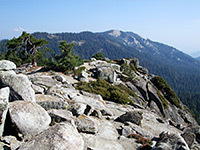 The trail to Buena Vista Peak crosses a thin belt of pine/fir woodland then follows a granite ridge dotted with groups of large rounded boulders, where the route is marked by cairns. The views are good already, down to the highway several hundred feet below and to the high Sierra on the horizon. The peak is visible ahead, above a steeper, tree-covered slope; the path curves to the left then zig-zags up the hillside to the summit, which is formed of smooth, glacier-polished granite topped by several more of the circular boulders. 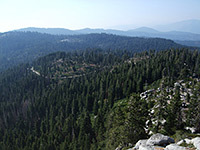 There are no trees to block the near 360° panorama - places in view include Redwood Canyon directly below, Park Ridge to the north, Big Baldy to the south and numerous mountains to the east.